LOS ANGELES (CNN) -- Kwanzaa, the seven-day celebration of African-American and African heritage, begins December 26. This year, celebrants hope their experience will be even more joyous because of last October's Million Man March in Washington. "Kwanzaa and the Million Man March reaffirmed and reinforced each other. Both in terms of stressing the African ethical tradition ... stressing family, community and culture, and stressing the principle of operational unity." "Kwanzaa and the Million Man March reaffirmed and reinforced each other," said Kwanzaa founder Maulana Karenga. "Both in terms of stressing the African ethical tradition ... stressing family, community and culture, and stressing the principle of operational unity." Karenga, chairman of Black Studies at California State University, Long Beach, created Kwanzaa in 1966 after the Watts riots in Los Angeles. He explained that Kwanzaa is based on five fundamental activities: the gathering of people; special reverence for the Creator and the Creation; commemoration of the past; recommitment to cultural ideas; and celebration of the good. Kwanzaa does not involve strict ritual. And for many celebrants, Kwanzaa does not replace Christmas. It offers the season a cultural enhancement. "For me, Kwanzaa offers an opportunity for an individual to search and to find themselves -- or another aspect of the holiday season -- that they may not be getting with Christmas," said celebrant Elimu Goss. 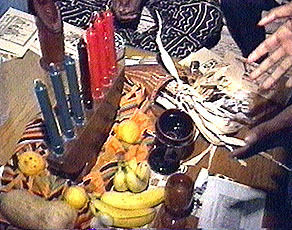 Kwanzaa combines elements of African harvest festivals with Caribbean and South American influences. Its base has widened with people celebrating from Germany to Canada, Turkey to India. Karenga's African-American Cultural Center estimates that 18 million people around the world celebrate some form of Kwanzaa. For the Mooney twins, Daryl and Dwayne, Kwanzaa has been a part of the holiday season for as long they can remember. The sons of comedian Paul Mooney attended the Million Man March and they believe its impact on Kwanzaa is significant. "We left with a sense of urgency, a sense of pride and a sense of collective direction," Dwayne said. "It's the continuation of the spirit of the Million Man March," Daryl added. "And it's going to be even more intense next year, because of the Million Family March, and it just makes it more festive." Sellers of Kwanzaa books, decorations, and traditional, hand-crafted gifts say sales are phenomenal this year. "It's very positive," said Los Angeles merchant Mary Kimbrough. "It says that African-Americans are seeking a greater sense of identity and closeness with each other." Although it pays tribute to both the past and the future, Kwanzaa is approaching only its 30th year in existence. It is still growing, and changing. For some, it is a small family gathering at home. For others it is a large formal one at a community center. For others, it is a celebration of unity.